We’ve already talked about innovation culture and open idea development, now it’s time to focus on techniques that help you facilitate your employees’ ability for idea generation and development. Many people claim to be either creative or not creative. People who claim to be uncreative often shy away from sharing their ideas or give up quickly. To a certain extent, however, creativity can be learned and fostered. So we’re going to focus on how you can lead your employees to more creativity and inventiveness with the help of numerous creativity techniques in the upcoming posts of this series. This time we will look more closely at the so-called 'lateral thinking' method. How is creativity promoted in general? Even a few simple exercises in the morning can help you become more creative - by getting the two halves of your brain to work together better. For example, try to involve your "weak" hand more. Do you usually brush your teeth with your right hand? Then use your left hand more often in the future! Another good exercise is this: Stand upright and raise your right knee to hip level. At the same time, bring your right hand to this knee. Repeat the same with the left side. For the next repetition, instead of the right hand, bring the left hand to the right knee and vice versa. Then the right hand again. Repeat these movements at high speed until you no longer have any problems with coordination. You will notice the results after only a few weeks! Creativity and new approaches in general are also encouraged in the company if you bring together people from different backgrounds and disciplines. Experienced employees, for example, usually have enormous know-how, but are often stuck in their usual ways of thinking – “if it’s not broken, don’t fix it”. Bring these employees together with young talents and look forward to the resulting ideas. If these employees also have specific subject matter expertise, there is even greater innovation potential. It is also exciting when employees from different cultural backgrounds come together. Although this also holds the potential for conflict due to cultural differences and resulting misunderstandings, with the right preparation this can be avoided and wonderful new ideas can emerge! 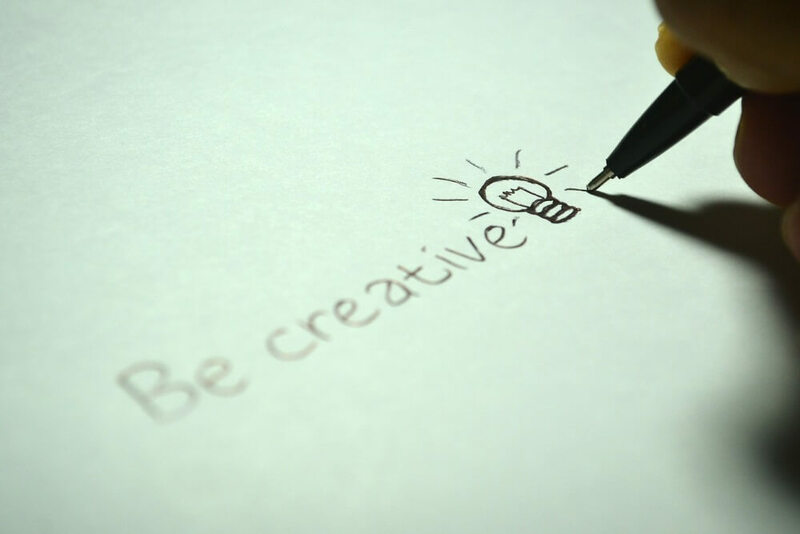 But those who want to promote creativity not only in general but also in a targeted way - for example in the course of a workshop - can draw from a pool of numerous creativity techniques. These include brainwriting, design thinking, catchball method, brainstorming, mind mapping and Lego Serious Play, which we have already looked at in recent years. Another possibility is the so-called 'lateral thinking' method. Before we dive in, let's start with a little puzzle to check how good you already are at lateral thinking: Tim and Veronika go to the movies. Suddenly Tim gets restless and begins to kick Veronika. Disappointed, Veronika leaves the cinema and goes home. What happened? The resolution is at the end of the article! But what exactly does lateral thinking mean now? Particularly important in lateral thinking is that not every step has to be correct or logical. Solving puzzles like the above can help you to get started and to learn lateral thinking. Lateral thinking, thinking in larger contexts and the conscious use of the absurd, the random - all this can later on help you to be more creative in your everyday work life and to break out of your usual patterns of thinking. Creative workshops can also be introduced with a lateral thinking exercise to warm up the grey cells. Veronika is eight months pregnant with Tim. Tim is kicking her from the inside. Employee-Led Innovation (3): Promote Creativity Using These Techniques - InLoox • Copyright 1999-2019 © InLoox, Inc. All rights reserved.